Ok, I just came down from trying to put Z to bed. Yes, yes, we still sing to them. We tried to take it away but they whine. V is much better sleeper in the sense that she falls asleep way before him most nights. It’s already 8:32 pm and he is having trouble falling asleep. This always happens when DST (Daylight Savings Time) hits. I’m sure there are plenty other people whose sleep is also affected by this change. Knock on wood. Why? So far, W has not woken up since she fell asleep with me. She’s definitely feeling much better now. It’s about time. It has been almost two weeks, for crying out loud! So she gets to go to daycare tomorrow. W got her Chicken Pox vaccine today. 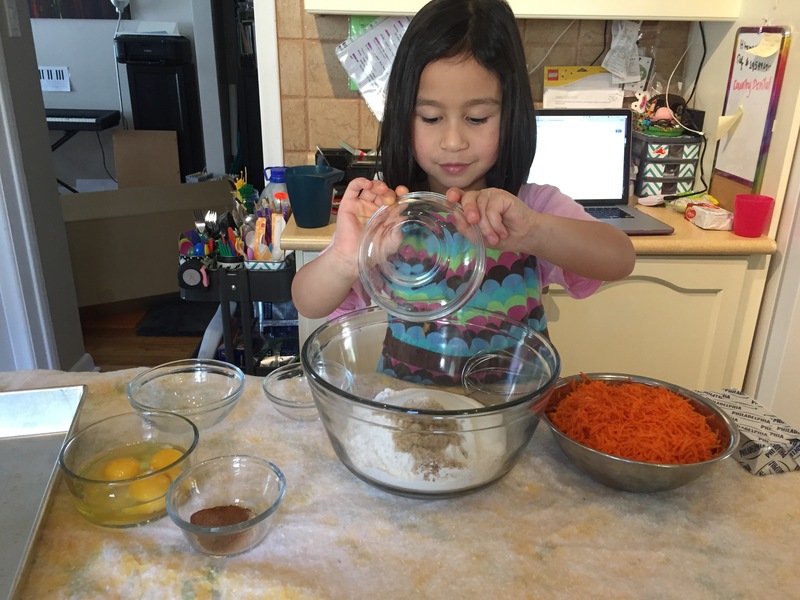 I got M to take her to the doctor while I stayed home with V and baked a carrot cake. I never knew she liked carrot cake that much. She asked me to “trim” off the edges of the cake so she can try it out. Cheeky monkey. As part of our decluttering efforts, I finally got around to posting the three Moby Wraps I own. I used to have more, if you could believe it. W is too heavy to go in it now that she’s a toddler. It was great when she was a baby though. We still have two toddler Tulas and a woven wrap that I’m still trying to break in. Oh, and not to forget, a Storchenweige ring sling, too. I still use all those every now and then, depending on the days. It now dawns on to me that this is the reason why playpens never worked with our kids. They just love it so much on us. Who can blame them, right? So, as mentioned, M said this week would be my birthday week. He asked what I wanted for my birthday. My response? A clean and tidy house. Maybe I should have also added, SLEEP. Well, may I say that it’s “getting there”? Honestly, there’s still a whole lot to do. It’s never-ending. Anyways, back to my birthday…Today, after M came home from picking up Z from school, he brought flowers that Z chose. 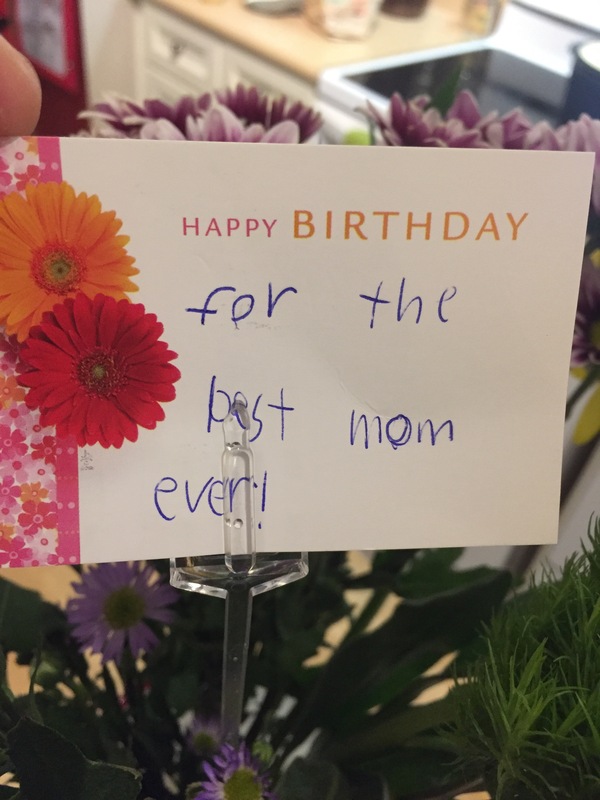 Z also wrote the sweetest message inside. It made me teary. On his own – no coaching. Just him. My sweet boy. Ok. I spoke too soon. W woke around 9pm and had a total freak out when M went to her. She’s usually ok. When I went to her she calmed down immediately. 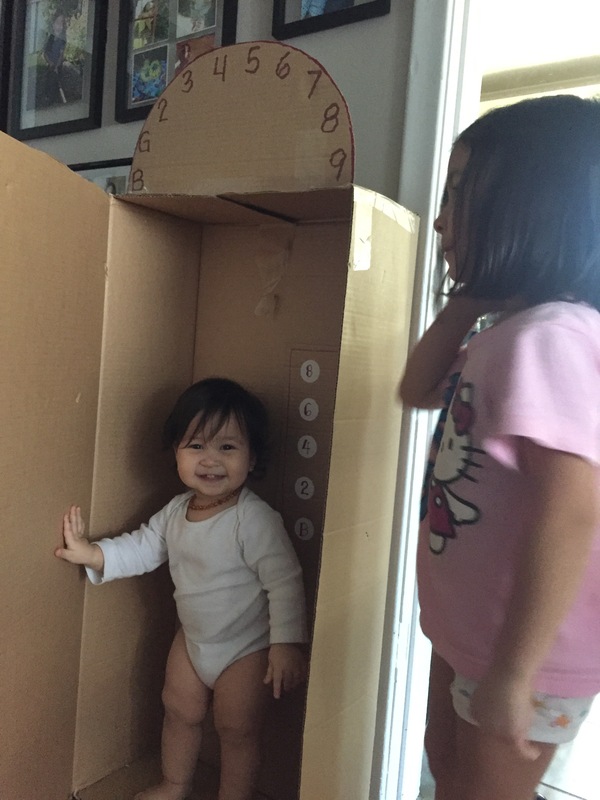 Oh, before I forget, I made the kids a cardboard elevator. Saw it on Pinterest and totally loved it. So did W. She knows what elevators are and pretends to press the buttons to choose a floor. She loves it when I ask her to choose a floor and I close the door, making the sound effects as the elevator goes “up” or “down”. I can’t believe tomorrow is already Wednesday. I feel like I still have a long list of things to get done before I go back to work. Yikes! Day 2 for W at daycare was better – slept longer and ate more. That’s good but when i picked her up she had laryngitis. She sounded so sad. Her cries are even worse. In fact when M went to her at her first wakeup, she cried so hard and it sounded so sad. She’s back asleep after nursing but has been coughing a lot. Poor thing. It feels like a long time since she was well. In the house, I tackled the spare room and tried to sort things out. It looks like a big mess right now. After reading those two articles from Intelligent Nest, I really want to make the basement a gross motor playroom. This would be great for the kids, especially for Z, since he always wants to kick a ball or play basketball. It would be a great space for all three of them. We already have a section of a wall with mirrors, for V, to use for dancing. Kind of like Adan when studio. Problem is we have all the Lego down there. We’d need to move them all somewhere. I’m not sure. Then we also have a basketball arcade that’s too tall for the basement. Too bad, it would’ve fit with the theme down there. Tomorrow, I’m going to try and finish the spare room. Maybe get a haircut as well. I need to go into the school this Thur to prep and touch base with the other two teachers. Friday, I’ll probably work on the basement. We’ll see.